We could not expect this result! Transforming a room at home can be expensive, but it is easy to make wonderful and inexpensive transformations. And that's what the creative blogger Susanna demonstrates, with the transformation of her bathroom floor. She runs a blog, "Living the Life of Riley", and found a beautiful photo of a black and white tile on Instagram that she wanted to recreate. It only took her a little research to find out how to make her bathroom without emptying her wallet, simply using paint and stencils. 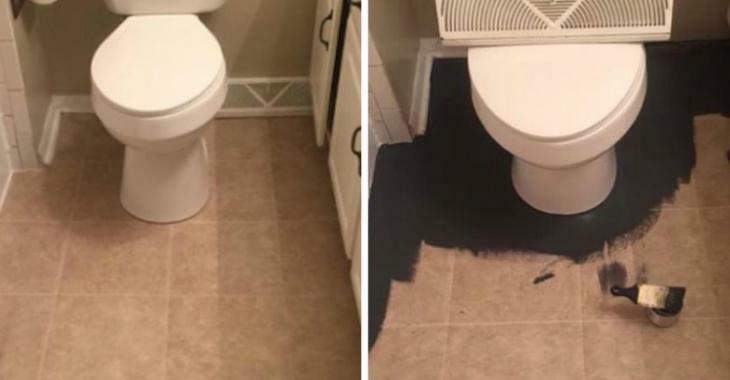 She has repainted her floor in black, even if it seems strange, the result is worth it! But this project takes time, she had to paint several layers and especially let them dry in the meantime. Once the floor was dry and well painted, she used a stencil and tape to trace the white pattern. And that's the final result! Her bathroom looks like the one of trendy home decor magazine. Obviously, she shared her project on her blog and received many congatulations. It looks like a real refined tile!